Markets look set for another bumpy ride Monday as investors fret that company profits may not be growing strongly enough to justify recent frothy prices. 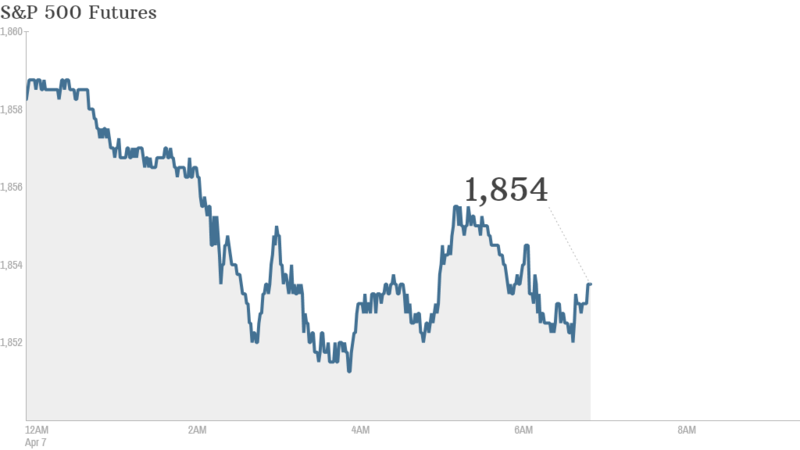 U.S. stock futures were clearly in the red, with the Nasdaq down 0.8% ahead of the open. The good news: The Dow and S&P 500 both hit all-time highs last week in a broad-based rally. The bad news: Stocks sold off Friday in a brutal finale for the week, with technology shares leading the way, as investors bailed out of companies that have been particularly hot. The Nasdaq plunged 2.6%, and the Dow and S&P 500 fell around 1%. There is little economic or corporate news on the docket Monday. But big banks will start reporting their first-quarter earnings later in the week and financial stocks are one sector expected to turn in a weaker performance. Earnings for the companies in the S&P 500 are expected to be down 1.2% in the first quarter, according to estimates from FactSet Research. Even if earnings are less than stellar, stock experts surveyed by CNNMoney say the bull market still has room to run. Most expect the S&P 500 to gain 6.5% this year. European markets and Asian markets were weaker, taking their cue from Friday's late sell-off on Wall Street. Japan's Nikkei ended 1.7% down, while Germany's DAX was trading 1.2% lower during the morning. Cement stocks provided one bright spot, with Lafarge (LFRGY) and Holcim (HCMLF)both managing solid gains after they agreed to a merger that would create the world's biggest construction materials group.